SheffMed provides a range of Container systems from Rudolf. Many size options are available including a custom fixation service. This is a separate costing, so please contact SheffMed directly for this as the options are varied. 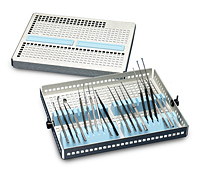 InstruSafe® Instrument Protection Trays protect and organize surgical instruments during sterilization, transportation and storage. Made of customized silicone instrument holders inside of highly perforated trays made up of aluminum bases + covers with locking lids. The aluminum construction is lighter than steel yet more durable than plastic, therefore more resistant to breakage, reducing frequent replacement. 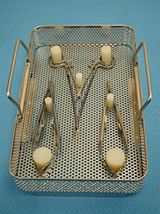 Providing optimum heat transfer, superior drainage and sterilant penetration, InstruSafe trays can be customized to accommodate virtually any set of surgical instruments. 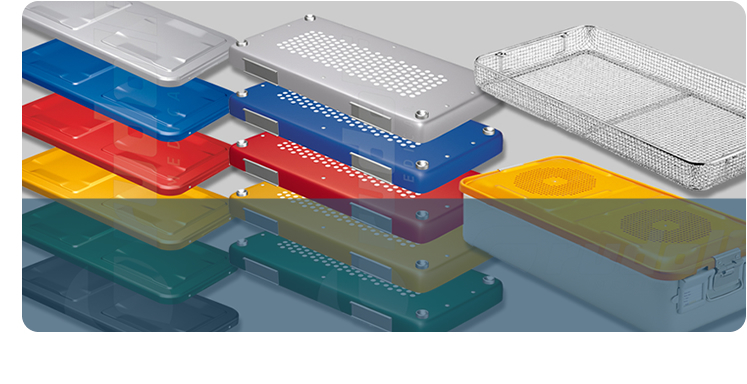 Trays can be used with wrap or in conjunction with rigid sterilization containers. .
Providing a range of economical Plastic Trays and silicone mats. Please contact SheffMed for further details. SheffMed has the ability to offer a Custom Fixation Service. This will ensure your valuable instruments are fixated in place and will not move in the containers. Rudolf Container Systems Basic or Prosafe - The choice is yours! The benefit of the prosafe version for the half, medium and full size containers is the safety lid, which offers addition security concerning contamination during storage and transportation. 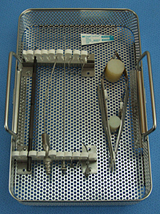 The new safety lid design with the external press-button enables a simple detachment of the safety lid from the filter lid and offers, therefor, a secure handling of the sterile goods.